Zlatan Ibrahimovic scored against his former club Ajax as Paris St-Germain secured a fourth straight Champions League win to stay top of Group F.
Edinson Cavani opened the scoring for the hosts before Davy Klaassen levelled with a powerful header midway through the second half. But Sweden striker Ibrahimovic made it 2-1 with a cool finish before Cavani added another after a poor backpass. Elsewhere, Shakhtar Donetsk qualified despite losing 1-0 to Athletic Bilbao. There were also wins for Sporting Lisbon and Porto, while CSKA Moscow held Roma in Russia. Paris St-Germain will advance to the knockout phase as group winners if they avoid defeat against Barcelona when the two sides meet at the Nou Camp on 10 December. In Group G, Nani scored his fourth goal in five Champions League appearances since joining on loan from Manchester United as Sporting Lisbon moved above Schalke after overcoming Maribor 3-1. Sporting, who have a two-point cushion over Schalke, face leaders Chelsea in their final group game next month. Athletic Bilbao recorded their first win in Group H beating Shakhtar Donetsk 1-0 in Ukraine. But Shakhtar were already assured of a place in the next round after Porto's 3-0 victory at Belarusian side BATE Borisov earlier in the day. Roma's Francesco Totti - already the oldest scorer in the Champions League - extended that record by opening the scoring in his side's 1-1 draw at CSKA Moscow at the age of 38 years and 59 days. But Vasily Berezutsky's equaliser 17 seconds from the end of added time kept the Russians in the race for the knockout stages and sets up a thrilling final round of matches in Group E, with Manchester City, Roma and CSKA all tied on five points. CSKA travel to already qualified Bayern Munich, while Roma entertain City on 10 December. Match ends, Paris Saint Germain 3, Ajax 1. Second Half ends, Paris Saint Germain 3, Ajax 1. Attempt missed. Edinson Cavani (Paris Saint Germain) header from the centre of the box is close, but misses to the right. Assisted by Lucas Moura with a cross. Attempt blocked. Nick Viergever (Ajax) left footed shot from outside the box is blocked. Corner, Ajax. Conceded by Blaise Matuidi. Substitution, Paris Saint Germain. Lucas Digne replaces Zlatan Ibrahimovic. Mike van der Hoorn (Ajax) wins a free kick in the defensive half. Corner, Ajax. Conceded by Marquinhos. Goal! Paris Saint Germain 3, Ajax 1. Edinson Cavani (Paris Saint Germain) left footed shot from the centre of the box to the centre of the goal. Attempt missed. 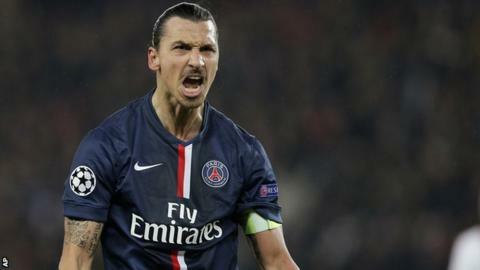 Zlatan Ibrahimovic (Paris Saint Germain) left footed shot from the left side of the box misses to the right. Assisted by Javier Pastore. Goal! Paris Saint Germain 2, Ajax 1. Zlatan Ibrahimovic (Paris Saint Germain) right footed shot from the right side of the box to the bottom left corner. Assisted by Javier Pastore. Attempt missed. Lasse Schöne (Ajax) right footed shot from outside the box is close, but misses the top left corner from a direct free kick. Ricardo Kishna (Ajax) wins a free kick in the attacking half. Foul by Clément Chantôme (Paris Saint Germain). Attempt blocked. Arkadiusz Milik (Ajax) right footed shot from outside the box is blocked. Substitution, Paris Saint Germain. Clément Chantôme replaces Adrien Rabiot. Attempt missed. Ricardo van Rhijn (Ajax) right footed shot from outside the box is too high. Assisted by Ricardo Kishna. Foul by Nick Viergever (Ajax). Substitution, Ajax. Niki Zimling replaces Thulani Serero. Substitution, Paris Saint Germain. Lucas Moura replaces Ezequiel Lavezzi. Goal! Paris Saint Germain 1, Ajax 1. Davy Klaassen (Ajax) header from the centre of the box to the bottom left corner. Assisted by Ricardo Kishna with a cross. Ricardo Kishna (Ajax) wins a free kick on the left wing. Corner, Ajax. Conceded by Gregory Van der Wiel. Attempt missed. Adrien Rabiot (Paris Saint Germain) left footed shot from outside the box is too high. Assisted by Edinson Cavani. Foul by Ricardo van Rhijn (Ajax). Lucas Andersen (Ajax) wins a free kick in the attacking half.